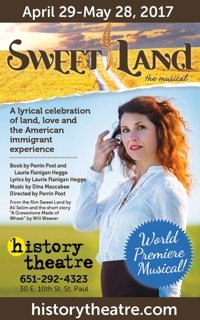 Cherry and Spoon: Interview with Playwright/Lyricist Laurie Flanigan-Hegge about "Sweet Land the Musical"
Interview with Playwright/Lyricist Laurie Flanigan-Hegge about "Sweet Land the Musical"
As frequent readers of this blog know, I'm not usually a fan of movies made into musicals. But when the movie is not some Disney blockbuster, but rather a sweet and lovely independent movie made in Minnesota, I'm all for it! The 2005 movie Sweet Land, directed and written by Ali Selim based on a short story by Will Weaver, is one of my favorites because of the sweeping Minnesota landscapes, the plethora of Minnesota actors, and the simple and beautiful story of love, acceptance, and community. A (mostly) local team has been in the process of adapting the movie into a musical for years, and their hard work is finally coming to fruition when Sweet Land, the Musical opens at the History Theatre this weekend. I've seen several readings of the work in progress (you can read about that here), and I've been so pleased how the creators have held true to the beautiful heart of the movie while adding music that feels organic to the story and only serves to enhance the storytelling. One of the creators, Twin Cities theater artist Laurie Flanigan-Hegge, answered a few of my questions about Sweet Land, the Musical, the development process of a new work, and the importance of supporting women playwrights and composers. C&S: How and when did you become involved with the musical adaptation of Sweet Land? Were you familiar with the movie before you started working on the project? LFH: My collaborator Perrin Post originated the project seven years ago. I came on board as lyricist and co-bookwriter over four years ago, and shortly after that, composer Dina Maccabee joined the team. I didn’t catch the movie in the theater when it came out ten years ago, but I did watch it before I was attached to the project and I immediately fell in love. It’s a beautiful film. C&S: I've seen readings or excerpts of the musical four times in the past three years (I'm basically a Sweet Land groupie). How has the piece changed in that time and what do you learn from readings of a work in progress in front of a live audience? Throughout our process, we’ve used various workshops to focus on a very specific set of questions. For instance, when Ben Krywosz at Nautilus Music-Theater invited us to do a Rough Cuts, we chose to explore a few songs that were either new or potentially on the chopping block. In fact, we trotted out a new song for the end of the show, and it was met with a resounding thud. That was great information to have, and a very safe place to learn that the song wasn’t working. Perrin received an Artist Initiative grant from the Minnesota State Arts Board that allowed us to get up on our feet and explore movement with the immensely talented Brian Sostek and Megan McClellan of Sossy Mechanics. The History Theatre specializes in new work. They provided us with two workshops, Raw Stages, where we worked on music and orchestrations with Robert Elahi (composer of C. and Twisted Apples) followed by a Next Stages workshop with our choreographer Joe Chvala. And of course, all along the way we’ve been tweaking the script. Tweak, tweak, tweak. It never ends. As for how much the show has changed over time, I would say that it’s grown more than changed. Since we’re adapting from the movie, our basic storyline is the same as when the process began, but there have been significant edits, including new songs. C&S: Will Weaver's short story A Gravestone Made of Wheat, upon which the movie Sweet Land is based, is elegantly simple. It's short and sparse, and screenwriter/director Ali Selim really fleshed out the story and the characters, and also shifted the focus of the story from Olaf to Inge. Did you go back to the original story when you were writing the musical, or is it mostly based on the movie? LFH: We did go back to the original story and found it to be a rich source of inspiration. I agree—I love its elegant simplicity. It’s no wonder that that story spoke to Ali Selim as well. By the way, Will Weaver will be at the History Theatre opening night. C&S: One of the things I love about the musical is that most of my favorite lines from the movie have become songs - "you're ducky," "I took a bath," "ducks dream." How much of the lyrics come directly from the movie/short story, and how did you decide which lines/scenes to turn into songs vs. dialogue? LFH: This may sound weird, but a great line or strong image will often demand to be musicalized. Although there’s always the exception. (No amount of begging and pleading on my part would convince my collaborators that Too Many Beans was a good song title.) But generally, a memorable line signals an important moment that bears musicalizing. By finding those beats, we find a map for where to place a song. This is one of the fun parts of working in this form. A line hits you and suddenly a whole new world of possibility emerges. “You’re ducky” is a great example. The line is so satisfying in and of itself that it becomes the hook of an idea, and ultimately the hook of a song. I look for ways to drop images or lines from the movie and short story into the song lyrics themselves, even if they are transformed somewhat in the process. Listen for the title of Will’s story in the opening number, as well as the quote at the top of the film. C&S: Whenever a duo splits music and lyrics duties in writing a musical, I'm curious how that works. Which comes first, the music or the lyrics? What is that collaboration process like, especially since Dina is not local? LFH: Our process is generally one where I write lyrics first and then Dina sets them, but before I even get to writing, Perrin, Dina and I have already talked a lot about what the song is going to be. Dina is a lyricist in her own right. Her feedback is an important part of the process and we’ll go back and forth a lot as we get finalize the song. We work via skype, phone, or email, and we’ve also spent a good deal of time in person together. It doesn’t feel like a long-distance relationship, although we’re not always in the same time zone—or on the same continent, for that matter. C&S: Fun Home made history last year when it became the first musical written by an all-female team to win a Tony Award for best score. Sweet Land also has an all-female creative team. Why do you think there's been such a lack of women as musical theater playwrights and composers, or at least a lack of recognition of them, and what are some current initiatives (both local and national) to support women writers in musical theater? LFH: Thank you for asking this question, because it is an important one and near and dear to my heart. The Lilly Awards are partnering with the Dramatists Guild in an ongoing study of gender parity in American theater called The Count. I saw the data from the very first Count at the 2015 Dramatists Guild Conference, where Lisa Kron from Fun Home unveiled the results: only 22% of the productions that were counted were written by women. I’ll never forget what Lisa said next: female composers were virtually unrepresented in the data. When Lisa Kron and Jeanine Tesori won their Tony for Best Score for Fun Home (the first time an all-female team won) their acceptance speech wasn’t shown on TV. If you missed it, Jeanine talked about how she didn’t know she could have a career in music until she saw a woman conductor on Broadway. In her words, “You have to see it to be it.” Visibility is everything. This phrase “virtually unrepresented” has stuck with me ever since, and has made me more intentional about supporting and signal boosting initiatives that support women writers and writers of color, such as The Lilly Awards, the New Griots Festival, The Interval, the International Center for Women Playwrights, the Ziegfield Club, and twitter handles like @womencompose. And while I take stock of the #genderparity issues around the country, I can’t help but feel grateful for the community in which I live and work, and the developmental support and first productions I’ve had at the History Theatre under Ron Peluso. They have produced four of my original musicals, including two new works written with my collaborator Marya Hart (a woman composer). They HT celebrates 40 years next season, and a look back at their catalog shows just how committed they have been to the development of new work from women and artists of color over their entire history. Look across our Twin Cities and you’ll find women playwrights thriving. Three women have national playwright residencies at Minneapolis theatres through the Andrew Mellon Foundation: Christina Ham at Pillsbury House Theatre, Aditi Kapil at Mixed Blood, and Kira Oblensky at Ten Thousand Things, and all four of the current Jerome Fellows are women. And yet, even if it feels like our ecosystem is healthier than most, issues of #genderparity permeate our national conversation and still demand examination and understanding on the local level. Here’s a link if you’re interested in learning more about The Count: http://thelillyawards.org/initiatives/the-count/. C&S: Is there anything else you would like audiences to know about the world premiere of Sweet Land the Musical? LFH: When we started on this project we couldn’t have imagined the political climate we’re living in today—a world suddenly turned upside down with (among other things) hysteria about people who “don’t belong here.” Every day we’re reminded how important it is to act with love in the face of fear and rejection. Inge and Olaf help us remember to do just that. Previews for Sweet Land, the Musical begin this week and the official opening is Saturday April 29, with performances continuing through May 28. See the History Theatre website for more information and to purchase tickets.